IN TERMS OF local government, you can’t get more a high-profile position than Lord Mayor. No matter how many press releases a rank-and-file councillor sends out — in terms of generating media attention, it’s impossible to compete with the draw of those chains of office. From school fetes to the visits of foreign dignitaries, the country’s mayors are rarely out of the pages of their local papers. But whatever their benefits, those ceremonial chains hold no special powers — a fact borne out last weekend as Dublin, Cork, Galway and Clare all lost their mayors in the local elections. All four were from Government parties, reflecting the fate meted out to Labour and Fine Gael councillors all over the country — as voters voiced their anger at the Coalition’s recent sub-par performance. So what’s it like to go from first citizen to… well, just plain ‘citizen’ in the space of a single election count? “To be honest, I hadn’t expected to lose my seat,” says Dublin Lord Mayor Oisín Quinn (yes, he’s still mayor for the moment). Then again, there’s always the danger that people are just being polite on the doorsteps. Long-serving councillor Mary Freehill was the only one of three Labour candidates to win a seat in the Rathgar/Rathmines ward of Dublin City Council in last Friday’s election. Quinn says that in spite of a series of dire opinion poll showings for Labour in the run up to the vote “there was probably a perception that I was probably going to hold on to it”. Those Southside voters are an unfailingly pleasant bunch, of course. The Labour Councillor says that while locals often said they were happy with his own performance in the Mansion House, there was “always a danger” the votes wouldn’t go his way. As Lord Mayor of Dublin there’s an extremely busy schedule of things… You’re out every day as part of the role, and I’ve been very busy working on various initiatives. Quinn says that while his schedule meant he didn’t canvass as much as he could have, the news that he hadn’t retained his seat still came as an unpleasant surprise. The phonecall from the RDS count centre came through after midday on Saturday, Quinn says. I was told the tally result. By 12.30 I knew I lost the seat. Listening to the coverage on the radio, Quinn says it had become more than apparent by Saturday afternoon that the party was suffering a similar fate in councils all over the country. I could tell there was carnage going on… It was looking like a bad day, there had been a big swing against us. He’d had an inkling a poor result might be on the cards in the city the previous day, however — as he called in to polling stations to see how turnout was going. Turnout was very low. But as I talked to presiding officers they started telling me that it was mostly older people who had been turning out. Given the Government’s introduction of new levies like the property tax and water charges, it seemed likely the grey vote was likely to go against the coalition. With younger people, though, there’s often a sense that the uplift in the economy might benefit them and they’ll have some wiggle room. Once the news of his defeat began sank in, there was still a visit to the count centre to endure. 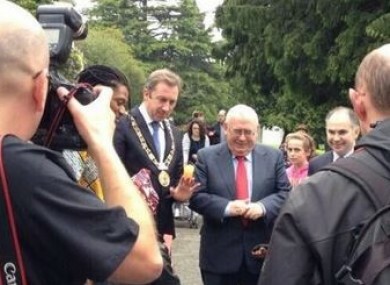 Come the following day, it was back the daily mayoral schedule of glad-handing and photo-ops, at the annual Phoenix Park Africa Day celebrations. “After ten years in office in local government, I’m happy Labour was able to show up and make decisions,” Quinn says — as he faces into his final week in office. A new Lord Mayor will be voted in, once his year-long term concludes on 6 June. Email “"I could tell there was carnage going on": Being voted out of office when you're mayor is pretty disappointing... ”. Feedback on “"I could tell there was carnage going on": Being voted out of office when you're mayor is pretty disappointing... ”.